A reservation constitutes a two way contract between the Colony Motel and you. It assures that your accommodations will be kept available for you for all the days indicated. It assures us that you will take the entire period booked. You are responsible for the number of nights reserved. A minimum deposit equal to the first nights rate is required for all reservations. Deposits can be made in Cash, certified Bank Check, Money Order or Credit Card (only with pre-approval). Sorry, no Personal Checks. There are a maximum of two children under 12 years old are allowed to stay free in the room with their parents. The Motel can not supply cribs. Please bring your own. Sorry, No switching rooms of original registered guests, once the Check-in process has been completed. There are no refunds on cancellations allowed for Prom Weekend and Holiday Weekend Reservations. Sometimes we sell out these dates months in advance (turning away other potential guests). This is a seasonal summer motel. Your cancellation may possibly cause loss of business without a opportunity to resell the room to someone else. On all other occasions, we will cheerfully refund a cancellation, with written notice (only), up to 2 weeks (14 Days) prior to arrival dates. Cancellation of a reservation with-in 14 days of arrival will forfeit your entire deposit. All cancellations are subject to a $25.00 cancellation fee. The customer is responsible for the entire balance of the reservation amount upon arrival. Early check-outs are subject to forfeiture of all funds paid for unused nights. It is understood that the Colony Motel will not be held responsible for inclement weather, loss of town electrical power, changes in travel plans, personal sickness or injuries etc... before, during or after your stay. The Colony Motel is not responsible for lost or stolen items. 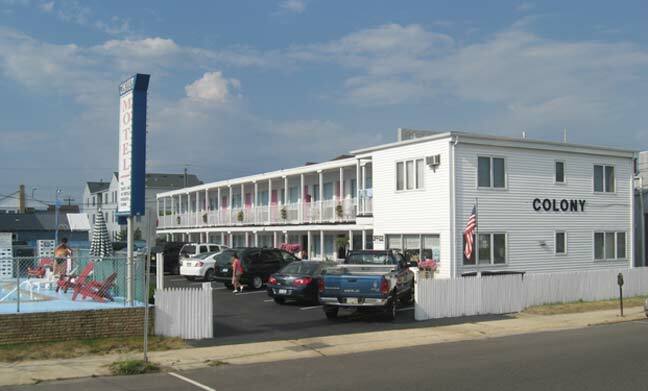 The Colony Motel values your patronage and appreciates your understanding.